Yes, I know this question(Geocoding and Reverse Geocoding) has been asked hundred times, but they are out of date. In the year of 2019, I would like to find out the latest and best approach of calculating geolocations. I know we can use EF Core to do the geocoding and probably calculate distance, but I found a document saying it's only for SqlServer, InMemory, PostgreSql etc. MySql is not on the list. Then I found System.Spatial, however it targets for the old .Net Framework. Then Microsoft.Spatial(it targets .NET Platform Standard 1.1, so I guess it should be okay for .Net Core 2.2, correct? ), but when I opened the git sample, it is about 2 years old. I really appreciate if anyone could point me the right direction. After reading through the OData Spatial Data, I found it's tightly bound to MS SQL and has certain limitations (https://devblogs.microsoft.com/odata/using-geospatial-data/)? However I am using MySql and seems this is not the approach I could use. Also this article was written back in 2011 and cannot see recent update. Just wonder whether this can be used in .Net Core 2.2? 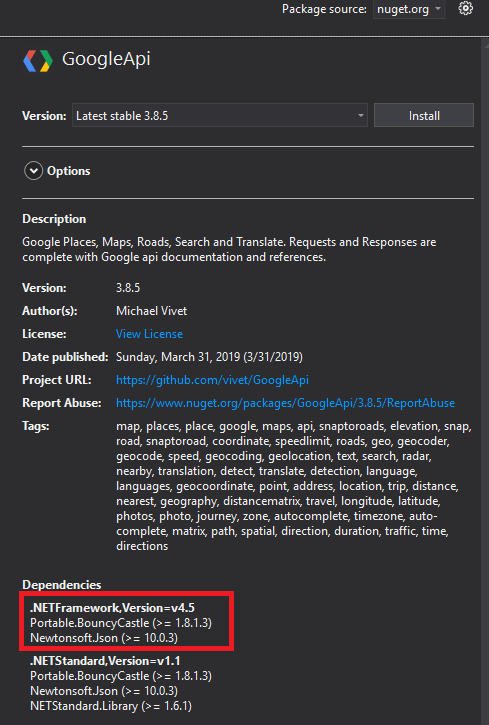 On it's github it says for .NET Core, BUT when I try to install it from the NuGet Package Manager, I saw it has dependency on .NetFramework v4.5. As .NetFramework isn't cross platform ,does it mean this NuGet Package won't be running properly on Linux ? The spatial data types are merely there to calculate distances between lat/lon pairs, and to calculate whether a certain lat/lon lies within a certain radius of another lat/lon. Addresses (being street names, house numbers, city names, zip codes and any combination thereof) get updated on a daily basis as new streets and new buildings are constructed every day. So you will need a frequently updated database that maps addresses to lat/lons. If you don't want to use a third-party API such as Google offers, you'll have to download and incorporate a database that does have this data. One of such instances is OpenStreetMap, where you can download the data and host the search API nomatim. By the time you've read the how-to you'll decide you do want to offload this to a third party. In the end, I use Google Api to do the geocoding with a RestSharp to make the api call. Not the answer you're looking for? Browse other questions tagged c# asp.net asp.net-core geospatial geocoding or ask your own question. Can .NET Core 2.0 speak OData v2? How can I migrate from ASP.NET Core 2.1 to 2.2 easily? Is the nuget packagge Microsoft.AspNet.WebApi.Core 5.2.7 compatible with .Net core 2.2?